Final Fantasy XIII-2 (ファイナルファンタジーXIII-2, Fainaru Fantajī Sātīn Tsū?) is a console role-playing game developed and published by Square Enix for the PlayStation 3 and Xbox 360. It was produced by Square Enix's 1st Production Department, with help from external developer tri-Ace. It is a direct sequel to the 2010 role playing game, Final Fantasy XIII, taking place three years after its events and is Square Enix's second sequel. The game was released in 2011 in Japan and 2012 in North America and PAL regions. The actual story will delve deeper into the Fabula Nova Crystallis mythology, and this time focus on the Goddess Etro. The worlds of Gran Pulse and Cocoon in Final Fantasy XIII return in Final Fantasy XIII-2. Players will be able to revisit old areas as well as new areas at various time periods, showing changes in appearance. Final Fantasy XIII-2 begins 3 years after Final Fantasy XIII. Vanille and Fang transformed into Ragnarok to prevent Cocoon's collision with Gran Pulse by turning themselves into a crystal pillar encasing the moon. Freed of her l'Cie status along with Snow, Hope, and Sazh, Lightning was reunited with her sister Serah as she awakens from crystal stasis. However, Orphan's defeat and Cocoon's fall had an unintentional side-effect which makes Lightning disappear to Valhalla. As a result, with the exception of Serah, many think that Lightning is dead or she sacrificed herself alongside Vanille and Fang. Two years later, many of the survivors of Cocoon's fall begin rebuilding their lives on Gran Pulse with Serah living in the newly constructed town of New Bodhum. One day, Snow leaves Serah to find Lightning. One year later, New Bodhum is overrun by monsters. 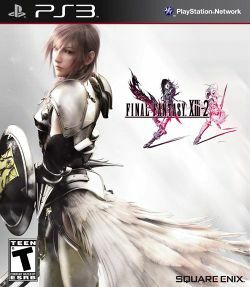 Serah is saved from the ambush by a mysterious youth named Noel, who claims to have met Lightning. Accepting his offer of bringing her to her sister, Serah sets off through time and space to find out what has happened to Lightning, while learning more about Noel and the mysterious enemy, Caius. This page was last edited on 9 July 2016, at 04:23.